Throughout the years since its formation in 1984, the choir has undergone continuous change. Its first priority has always been to achieve the highest possible musical standards – a lofty ideal for an amateur group. In the past two years with the appointment of Musical Director Douglas Heywood, and accompanist Linda O'Brien, their repertoire has expanded greatly whilst still retaining its core of Welsh music. The chior is frequently called upon to perform at a variety of prestigious and sometimes unusual events. In early 1997 they were invited to perform at Government House, Melbourne to commemorate Australia Day. Earlier they had appeared at a gala concert at the Melbourne Tennis Centre to help the Royal Australian Air Force celebrate its 75th anniversary. During the Welsh Rugby Union side's tour of Australia in 1996, they led the singing of the anthems at Melbourne's Olympic Park. They are at home on any stage, whether it be at the Melbourne Concert Hall or the tiny Toongabbie Mechanics' Institute in the heart of Gippsland and in 1997 toured South Africa for the first time. Phillip Smith M.I.M.T. - Phillip was appointed Director of Music in June 1995. His career and training includes time as a performing member of both Melbourne and Sydney Symphony Orchestras, the Australian Choral Society and the Choral Society of the Australian National University. He has also performed as a baritone and tenor with the Canberra Operatic Society. He is an active member of the Australian National Choral Association and the Royal School of Church Music. He is a member of the prestigious Institute of Music Teachers, and has previously held the position of National Co-ordinator with Youth Music Australia. Linda O'Brien (B.A. BMus. (Hons) LMus.A) – Linda joined the choir as accompanist in 1996 and immediately made a significant impact on the standard and repertoire of the choir. She is a Music/Arts graduate of the University of Melbourne, with majors in piano performance, French and mathematics. She has traveled extensively, and for several years was based in Montpellier, France, where she studied jazz piano. As a freelance accompanist she performs regularly with the Australian Pops Orchestra, the Victorian Arts Centre, the Australian Girls' Choir and the Victorian Brass Bands League. 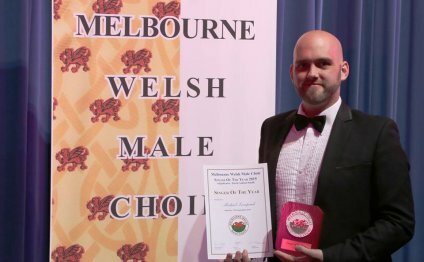 The Melbourne Welsh Male Voice Choir presents its first concert on their own at the Melbourne Concert Hall for the first St. David's Day of the new millennium.